On August 2, 2018, State Councilor and Foreign Minister Wang Yi held a bilateral meeting with Foreign Minister Sergey Lavrov of Russia before attending the Foreign Ministers' Meetings on East Asia Cooperation in Singapore. Wang Yi expressed that not long ago, President Xi Jinping and President Vladimir Putin held a successful meeting on the sidelines of the BRICS Summit in South Africa, during which they had in-depth strategic communication on the current international situation and how to further advance China-Russia comprehensive strategic partnership of coordination, and reached new important consensus. Such gestures highlighted again that China and Russia treat each other as the most important strategic partners. Both sides should ensure that other high-level exchanges within this year will achieve fruitful results, so as to provide impetus and further chart the course for China-Russia comprehensive strategic coordination. 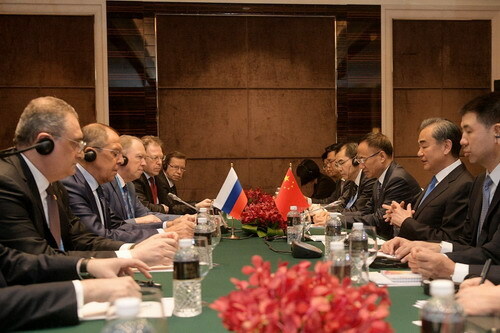 Sergey Lavrov expressed that Russia and China enjoy very close relations. Besides President Vladimir Putin's recent successful visit to China and the recent successful meeting between the two heads of state in Johannesburg of South Africa, there will be a series of high-level meetings between both sides within this year. The Russian side stands ready to intensify cooperation with the Chinese side to ensure the high efficiency and success of the meetings. The Russian side expects to continue strengthening strategic communication and coordination on major international issues with the Chinese side. Both sides also exchanged views on the Korean Peninsula situation and other international and regional issues of common concern.